Love your iPhone, iPod or some other MP3 player? Great. But what are you going to do when it comes time to get rid of it? Did you know many electronic gadgets such as MP3 players contain heavy metals and other toxic chemicals that are not safe to simply throw out in the trash? The explosion of portable MP3 players over the last few years has created a host of new problems. Yes, CDs contain metals and petroleum-derived plastics, but MP3 players contain heavy metals and other toxic chemicals, such as lead, cadmium, mercury and brominated flame retardants, which have been linked to health ailments including kidney damage and neurological impairment. When MP3 players are discarded in landfills, these chemicals can leach into groundwater. Adding to the problem is the short life span of most MP3 players. With 300 million iPods sold since 2002 and a virtual stranglehold on worldwide digital music sales thanks to iTunes, Apple has been singled out by green groups that have accused the company of encouraging the “planned obsolescence” of its ubiquitous gadgets. The real cost of music, and how you can trim the bill. I download almost all of my music these days from iTunes, and rarely visit a music retailer. It seems that I’m not alone. Compact disc sales in North America have dropped 52 per cent since 2000. Digital downloads, on the other hand, increased 13 per cent in 2010, and digital sales now represent more than a quarter of the music industry’s global income. The transition to digital music means less aluminum goes into CD production, paper liner notes disappear, and fewer environmentally damaging plastics are used to make discs, jewel cases, vinyl records and cassette tapes. What’s more, digital music has the potential to reduce the energy used to produce and deliver music to consumers, all of which must surely be good for the environment, right? Did you know a third of all landfill waste comes from demolished houses? The new trend in house removal is away from demolition and toward eco-friendly deconstruction. Everything that can be saved -doors, windows, the fireplace mantel, oak flooring, tiles, beams, two-by-fours -is being removed. Could the digital music revolution be good for the environment? I download almost all my music these days (legally!) and rarely visit a music retailer anymore. It would seem I’m not alone. For the fourth straight year, CD sales in North America dropped significantly in 2010 and total album sales are down 52% since 2000. Digital downloads on the other hand increased 13% last year, continuing an upward trend. That means less aluminum is needed for CD production, less plastic for jewel cases and no more paper liner notes. What’s more, digital music has the potential to reduce the energy requirements of producing and delivering music to consumers. The transition to digital music must surely be good for the environment, right? Well, it’s not quite so simple. The explosion of portable MP3 players over the last few years has created a host of new problems. To begin with, these players can contain various heavy metals and toxic chemicals such as lead, cadmium, mercury and brominated flame retardents (BFRs) that are much more harmful to the environment than CDs. These materials can leach into ground water and have been linked to health ailments such as kidney damage and neurological impairment. Adding to the problem is the short life span of most MP3 players. 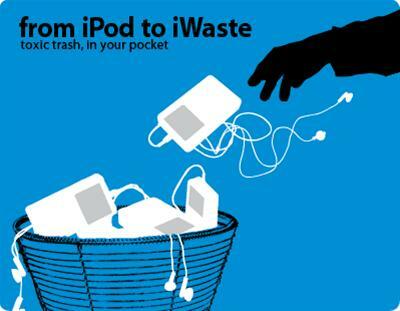 Having sold nearly 300 million iPods since introducing them in 2002, Apple has been singled out by environmental groups for encouraging the “planned obsolescence” of their products. Rather than replacing old batteries or repairing defective iPods, neither of which is convenient or cheap, consumers simply buy the latest model and discard old ones. To discuss this issue further, I recently spoke with Casey Harrell who is a toxics campaigner for Greenpeace International. We discussed his organization’s Greener Electronics Campaign, which provides a wealth of information on e-waste, what happens after it is thrown away, which companies are top and bottom of the toxic product class and the solutions to the problem. Greenpeace also produces a very informative Guide to Greener Electronics, which ranks the 18 top manufacturers of personal computers, mobile phones, TVs and games consoles according to their policies on toxic chemicals, recycling and climate change. The transition to digital music may well prove to be environmentally beneficial, but we’re not there yet as Casey explains. Regulations on the use and disposal of toxic materials, extended producer responsibility laws, eco-certifications, improved product durability and better communications of recycling options are all needed to make the industry truly green. To download the interview, right click here and select ‘Save as’ or ‘Save target as’. If you’re interested in learning more about e-waste and what you can do about it, here are some additional resources. Electronic Product Stewardship Canada – Electronics Product Stewardship Canada (EPS Canada) is developing a national electronics end-of-life program in Canada. Un-friend Coal – Greenpeace campaign to make Facebook run on clean energy. Facebook announced in February 2010 that it is building a massive data centre in Oregon, U.S., packed full of the latest energy efficient computers to serve the hundreds of millions of friends connecting on their social networking website. But the company plans to run the place on electricity made by burning coal. Take my Mac – The organization running this web site will buy all your Apple products. Whether it’s a brand new iPhone or an old iBook laptop, they will take it with no hassle without the time and frustration of selling it yourself. Plus, we even take products that have no value or that are damaged. 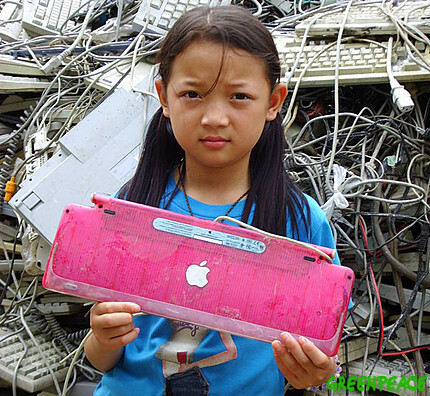 U.S. National Center for Electronics Recycling – The National Center for Electronics Recycling (NCER) is a non-profit organization that is dedicated to the development and enhancement of a national infrastructure for the recycling of used electronics in the U.S. The National Geographic Green Guide – an online environmental information resource that provides every day living tips on waste, transportation, home and garden, travel, food and so on. Electronic Products Environmental Assessment Tool – EPEAT is a method for consumers to evaluate the effect of a product on the environment. It ranks products as gold, silver or bronze based on a set of environmental performance criteria. Check out this cool and educational animation. The Story of Electronics takes on the electronics industry’s “design for the dump” mentality and champions product “take back” to spur companies to make less toxic, more easily recyclable and longer lasting products.